This year’s World Press Photo winner was a surprise to many – it is unlike from the usual, often dramatic, news-driven shot. Instead, it is a tranquil interpretation of migration and globalisation. This year's winner of the World Press Photo of the Year 2013, Contemporary Issues, is John Stanmeyer and his picture commissioned by National Geographic. 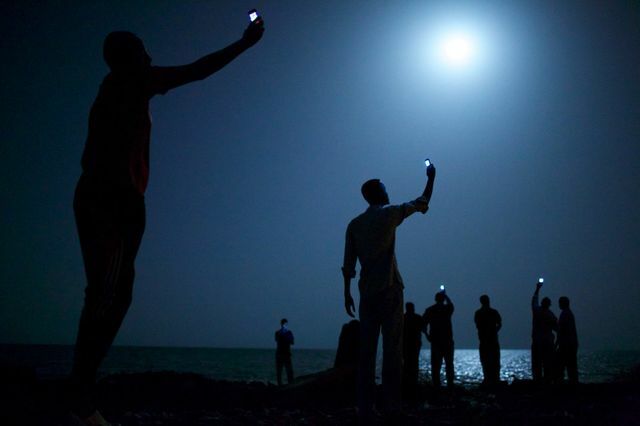 His photograph shows African migrants at night on the shore of Djibouti city, raising their phones in an attempt to capture a cheap signal from neighbouring Somalia – a tenuous link to family members abroad. Djibouti is a common stop-off point for migrants traveling from countries such as Somalia, Ethiopia and Eritrea, looking for a better life in Europe and the Middle East. A great example of a photo that speaks volumes once the context has been explained. A well deserved winner, I'd say.